We are celebrating ChinesePod users, the brand and our content in a unique and fun way. 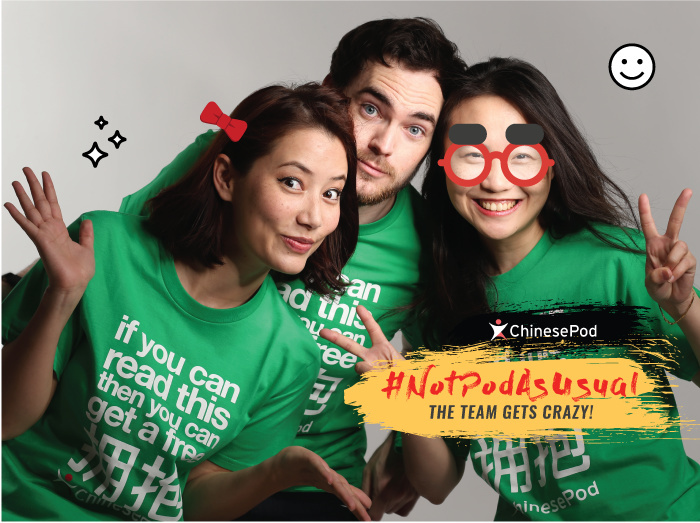 Join the ChinesePod team between October 2nd, 2017 ~ October 15th, 2017, for the #NotPodAsUsual campaign. To strengthen our relationship with our community and to better engage with you, our loyal fans, we have created two weeks of unusual lessons and activities. We will still teach Mandarin, but #NotPodAsUsual . Submit your questions before Friday, September 29th. Don’t miss your chance to win #NotTheUsual prizes or discounts on subscriptions. Participate and share your ideas, as we release the content we have prepared specially for you! Stay Tuned - The coming weeks are all about having #NotTheUsual fun! Fiona, Gwilym and Constance what’s your favorite food? What do you like the most about living in Taiwan? And what do you like the least? What is the most embarrassing mistake you’ve ever made in Chinese? Which is your favorite place in Taiwan? I speak spanish, Chinese can be quite dificult, where would you recommend to start studying chinese? What’s the difference between 皮包 and 包皮? The characters seem to be the same. What is the best and the worse experience you had had learning or communicating in other language? How effective is the HSK exam at testing your Chinese abilities? And what level is a good level to show your a basic Chinese speaker? I’m more interested in the structure of Chinesepod as a business… Did Fiona and Gwylim buy it from John and Jenny? Or is the ownership separate from the hosts? What are John and Jenny up to these days? These questions may have been answered when the transition happened, but i wasn’t around at that time. Also, Fiona’s chinese name (Tián Xīn I think) sounds like ‘sweet heart’, but I think I saw different characters somewhere. Did your parents intend ‘sweet heart’ to be a kind of double meaning when naming you? thanks! A penguin walks through the ChinesePod’s office door wearing a sombrero. What does he say and why is he there? Bonk/Marry/Kill? Jon Snow. Jaime Lannister. Tyrion Lannister. Would you rather fight 100 chicken sized horses or a horse sized chicken? If you could spend a dinner with a famous person, who would it be? I dare you to do a hand stand or a split. Seeing that you guys live in Taiwan – What are some of the biggest linguistic differences you have noticed between Taiwan and Mainland China? Are there any movies or TV shows we can watch that will help us in learning Mandarin?? I’m thinking children’s shows might be best for intermediate learners like myself. I know you guys like GOT (so do I! ), but maybe while we wait forever for the new season to be produced, do you think you can do an episode on the Walking Dead? !